The schedule for the next days will be updated soon. Note: For those who have reserved their hotels that are not on the list that we have mentioned on our website (http://ecrs9.utt.fr/liste_hotels_anglais.pdf), we have stated that the shuttle will not be able to pick you up or take you back between your hotel - UTT/other places. Therefore, we suggest you to manage to go by yourself from your hotel to the meeting points where the shuttles are available, and vice versa. From Paris (160 km): highway A5, exit n° 20 Sainte Savine in the direction of Troyes on N60, then take the ring road. From Dijon (150 km): highway A5, exit n° 21 Saint Thibault in the direction of Troyes on N71, then take the ring road. From Gare de l'Est there are trains that go directly to Troyes. Departure approximately every two hours during the day and evening. The journey normally takes between 1 ½ and 2 hours. From another train station in Paris people must take either the underground (metro) or a bus and get off at the Gare de l'Est metro station which is also one of the main train stations. Then, take the train to Troyes. Take the RATP bus 350 and get off at Gare de l'Est (the journey takes about an hour). The Gare de l'Est station is not located at the end of this bus route so make sure to get off at "Gare de l'Est" or use ROISSY RAIL - go to the RER station in the airport and take RER B in the direction of the "Gare du Nord". The ticket includes a Metro connection. Get off at Gare du Nord and either take the Metro, or walk (10 minutes) to Gare de l'Est. Total length of the journey is about 45 minutes. ORLYVAL : Take the automatic metro Orlyval to "Antony" station then take RER B in the direction of "Gare du Nord". The ticket includes a Metro connection. Get off at the Gare du Nord and take the Metro, or walk to the Gare de l'Est (10 minutes). Total length of the journey is about 45 minutes. It is also possible to use private shuttle services From Paris airports to Troyes after previous reservation (120 € for individual travel and degressive rate for groups). 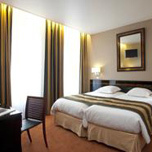 Troyes is a touristic town with a hotel capacity sufficient to accommodate all the participants of ECRS-9. The presence of major hotel chains and independent hotels will allow everyone to find the desired accommodation type. When organizing congresses, University of Technology of Troyes asks kindly hotels to book, up to three weeks before the conference, part of their rooms, thus facilitating the process of each individual participant. The rooms rate varies between 200 € (hotels five stars) and 40 € (hotels F1). Please only choose a hotel that is listed on the list of hotels that we provide below. We have shuttle buses in Troyes that will pick you up from the hotel and take you back to the hotel during the conference in Troyes. If you choose a hotel that is not on the list, we will not be able to pick you up. Remember to mention/write "ECRS-9" when you make a hotel reservation. > Download "Total amount of tourist accomodation"
Groupe ADPS/Groupe ESC Troyes manages a residence. It is located near University of Technology of Troyes. This type of accommodation will be offered to those who want it. Please contact lydia.rigaud@utt.fr for more information. Several shuttles will be organized twice a day (in the morning and at the end of the day) to relate hotels to the UTT Campus.